As a body of work, "I Got a Right" is a humorous look at the transience of identity. These works can be seen as cautionary allegories about the cartoonish ambivalence with which roles -- good and evil, rich and poor, watcher and watched -- are assigned in contemporary culture. 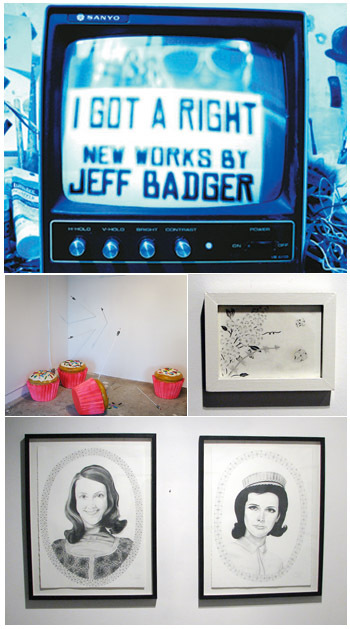 Also on view, drawings by Melinda Barnes and Kevin Oster. Ms. Barnes creates a personal world of poignant narratives involving everyday objects and anonymous participants. These small drawings, evocative in their familiarity, have a dream-like quality in the way in which series of images flash before our eyes the day after the dream. Mr. Oster has produced a fabulous collection of portraits drawn from knitting catalogs from the 1950's. These "ladies" model their knits with dignity and fierceness -- finely crowned by inventive "knitted" borders.